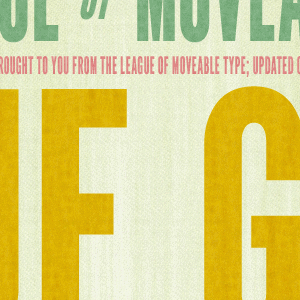 The League of Movable of Type is a group of typographers that have taken upon themselves the task of creating beautiful, complete and professional looking (free) fonts for everybody to use. Fonts that look like dripping blood or something a computer in a sixties sci-fi film would spit out are all well and good for Halloween party posters, but when you want to produce professional looking documents, you need clear and understated fonts that are readable and will look elegant on the printed paper. That’s exactly what The League of Movable Type has to offer. The League offers but a handful of fonts (as opposed to major clearance sites like DaFont or FontSquirrel), but, what fonts it does offer, are uniformly elegant, usable in many types of documents, and complete. Take League Gothic, for example. It’s ideal for magazine or newspaper headlines or posters, it comes in regular, expanded, condensed, and oblique, and is more or less glyph complete, which means that if you are using it for writing in languages other than English, all your Ã‘s, Ã˜s, and Ã†s will be there. 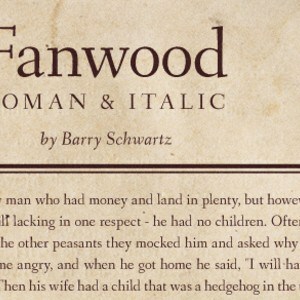 Or take the marvellously understated Fanwood font, a typeface that wouldn’t look out of place in the most exquisitely laid out 19th century novel. The founders and contributors of the site are professional typographers that painstakingly reproduce and expand type families that have passed on into the public domain. They then distribute the digitised sets under a generous open source license. You can express your support to the League joining their site, subscribing to their newsletter, or simply shooting them an email offering help or expressing your support. Do you create fonts or other graphical assets and distribute them under a free license? Why not join Pling and tell us about it? We’ll help you fund your work and help you build a community of users. Cover image: “Picture taken in Playground” by Cajole for FreeImages.com.